First, you will need to download the windows binaries here as well as the Quick Start Files. Once that is done, open the two files (both the .tar.gz AND the .zip) and extract all of their content into a folder (In this tutorial, we will use C:\Garlic\). This can be done in two ways, the Graphical Way (Recommended) and the Command Line way. In your installation folder, there should be a file called Run-Network.bat. Open that file; a command prompt window should open. Make sure you Allow Access through your firewall (if it asks you). You will have to open this any time you wish to use your wallet (or when solo mining). For the more experienced, open a Command Prompt. Once that is done, run the command: garlicoind. Windows might ask you for Firewall Access, Allow it. 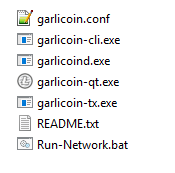 Back to your Garlic folder, there should be a file called garlicoin.conf. This file needs to be moved to the Garlicoin folder found in AppData\Roaming. To access this folder, Open RUN (Windows + R), and type %appdata%. This should open a folder, locate the Garlicoin folder and move the garlicoin.conf file to it. Just to be sure that everything was done correctly. Close your Network window (the one Run-Network.bat one) by holding Ctrl + C.
Now repeat Step 2, you should be good to go. While keeping your network window open, Open a new Command Prompt. Navigate to your Garlicoin folder (use cd C:\Garlic\), and type garlicoin-cli getblockchaininfo. This command displays information about the blockchain you have downloaded, the blocks value at the top is the number of blocks that has been recieved. You can run this command a few times to check the statu. Once it hits the value (https://garli.co.in/api/getblockcount)[here] your blockchain sync is complete. If you have installed on a different drive, you need to type the letter of your drive followed by a colon. For example, drive F would be F:. Then press enter. Type cd C:\Garlic\ (or whatever your installation folder is) and press Enter . 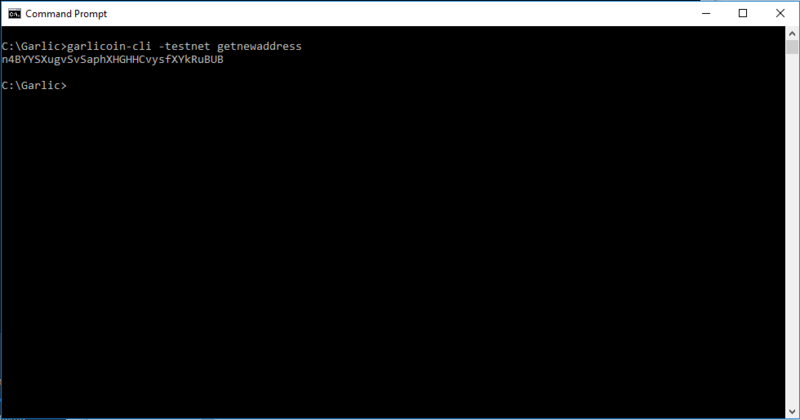 In the Command Prompt, type this command: garlicoin-cli getnewaddress. (To copy from the Command Prompt, select the address with your mouse and then right click). To make sure that you have done everything right (or to view your balance), you can type: garlicoin-cli getwalletinfo in that same Command Prompt. In a Command Prompt window (while the network is running), type the command: garlicoin-cli backupwallet <path>. and overwrite the wallet.dat file inside the folder by the backup one. If you ever wish to send Garlicoin to someone. You can use this command garlicoin-cli sendtoaddress <bitcoinaddress> <amount>. If you are getting this error, let it keep retrying. It should correct itself soon. If you are getting this eror, it means that your Command Prompt is not opened in your installation directory. Make sure that you have used cd C:\Path\To\Garlic\Folder before running your command. Try changing your .conf file to have the content found on the Changes page.